You’ll recall that this is the year our meat is real – where we only eat meat from animals we’ve grown ourselves here on the farm. As the first quarter of the year is nearly past, I figured this was a great time to share a vegetarian recipe, as for the first six weeks of eating our own meat, we didn’t have any! It was an interesting experience having six weeks as predominantly vego, but not entirely, as we had homemade chicken stock from our own chooks still in the freezer, plus some chops and our pancetta from the first pig. So while our meals were overwhelmingly plant-based, there were delicious little morsels of ethically-raised meat added to some of them. I had to keep catching my former vegetarian brain from admonishing me against the bit of pancetta or the chicken stock, remembering that I wasn’t seeking to be a vegetarian, just to rely on our own meat! A quick look at our meals in the first month shows that we enjoyed the following list of fantastic plant-based meals: fettucine with pancetta & mushies, cheese souffle & garden-plucked artichokes, veg Hokkien mee, veg penang curry, banh mi op la, stuffed parathas, 2-cheese ravioli (made by 11yo Antigone), rice paper rolls, gado gado, pasta puttanesca… and that was just the dinners! Our brekkies, as usual, included a wide range of egg-based dishes, including: Beijing-style egg & tomato, spicy Indian omelet, eggs en cocotte, Chinese fried eggs with oyster sauce, spring onions and chili… and a bit of Bircher muesli for good measure. The only real work in making laksa is the paste, but a decent food processor can make this a pretty quick task as well. My own food processor is not really that decent and leaves the harder ingredients such as galangal and lemongrass a bit gritty in the paste, so I’ve always preferred my mortar & pestle. Because this is such a favourite in our house, sometimes the craving won’t be denied though the larder is lacking. I’ve found that adding dried turmeric for fresh, though not as pungent and magical as the lurid orange rhizome, is definitely sufficient for the job. A lack of galangal is a problem, in my opinion, as its aromatic qualities are not easily replicated with anything else. And although many traditional laksas call for rice noodles, we love the fat toothiness of hokkien noodles. 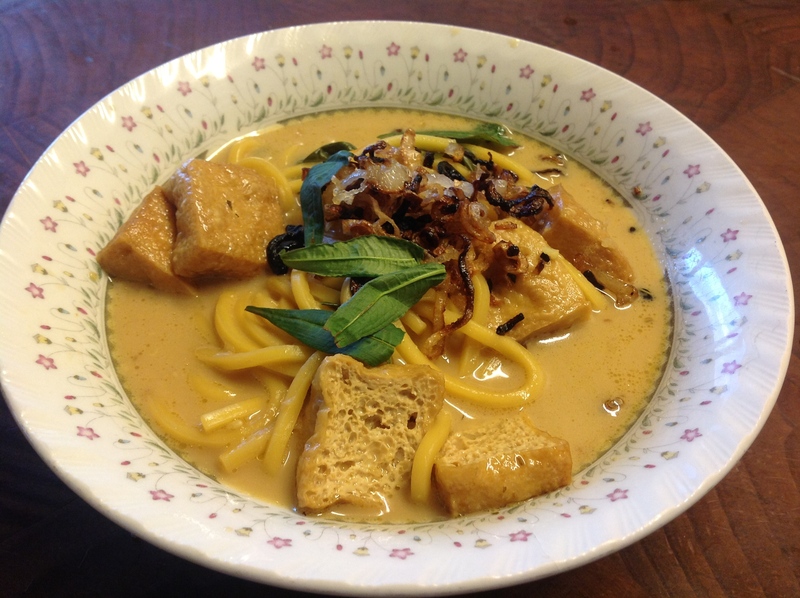 But be bold and you’ll be eating laksa of many creative varieties in no time! It’s simplest to make the paste in a food processor, but when you have a bit of time or need to work through some aggro, a mortar & pestle is definitely your friend. It also makes a smoother paste, in my experience, with the flavours pushed together better. Once the paste is made, heat a drizzle of peanut oil on a medium flame in a large pot and pop 3-4 T of the laksa paste into the pot. When it colours and before it burns, pour the coconut milk in and stir frequently. Once it’s hot, add your stock (we use homemade chicken stock, but of course a flavoursome homemade vegie stock is an excellent option as well) and heat through. Add lime juice and soy and taste – adjust to your palate. Add your leafy greens and the tofu puffs and heat through. I pre-heat the hokkien noodles in a bowl of hot water, then drain them and add them into the soup at the last minute. Alternatively, after warming in a bowl you can put them straight into the bowls and pour the soup over the top. Garnish each bowl with bean sprouts, Vietnamese mint, and crispy shallots. A small bowl of chopped chilies for the strong-tongued is a nice addition to the table, and of course some sambal oelek should be offered. The only real trick to laksa is how to eat it without splattering your chest, something I cannot profess to have mastered reliably. Enjoy!